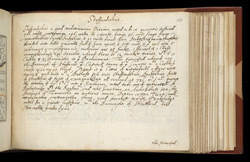 This is the description of Staffordshire accompanying the map of the county in Pieter Van den Keere's miniature County Atlas of the British Isles, dating from c.1605-10. Van den Keere was a refugee who came to England, with his sister, to escape religious persecution in the Low Countries between 1570-1590. After their arrival Van den Keere's sister married the map maker Jodocus Hondius, a fellow refugee, and it is likely that it was from his brother in law that Van den Keere then learnt cartography and engraving. This atlas contains maps of the English and Welsh counties, the regions of Scotland and the Irish provinces. The maps of England and Wales were based on those of Christopher Saxton who had published an atlas in 1579. The Scottish maps were based on those of Abraham Ortelius and the Irish on a map by Baptista Boazio.